Client self care: Does it work? The psychology of self care: Power to the People! To understand why self -care can be so powerful we need to look at the psychology behind it – the so- called “locus of control”. You will know from your own experience that the world tends to be divided into 2 types of people: those that believe they can alter their circumstances by their actions and those who believe they are at the mercy of outside forces such as chance, fate or the whims of authority. Psychologist Julian Rotter (1966) came up with the concept of locus of control to explain this tendency. People with an internal locus of control believe they can control events that happen to them whereas those with an external locus of control believe they are powerless to control outside events. (FIG 1). Crucially the sense of locus of control is not fixed and can be altered through education or experience. So what does this sense of control have to do with helping your client’s persistent bad back? Actually everything, as research shows that the locus of control is highly correlated with successful treatment outcomes. For example headache sufferers with a high internal locus of control respond better to treatment and are less disabled by their pain (Nicholson 2007). On the other hand, believing that relief from low back pain is determined by factors outside of individual control (such as chance or the interventions of health care professionals) is related to higher levels of disability and poorer quality of life (Sengul 2010). Doctor Doctor what are the best exercises to do? This old joke neatly summarises the best approach to prescribing self care. The truth is that the best exercises to suggest are the ones that your client will actually do. There can be a big gap between “knowing” what is good for you and actually doing it and studies show that as many as 70% of physiotherapy clients do not do their prescribed exercises (Beinart 2013) (FIG 2). Therapists often get cross and blaming about clients who “don’t help themselves”; you know – those pesky people who “don’t do their exercises”. (Totally unlike our good selves who never sit and eat cake or watch TV as we are busy spending every moment in unrelenting self- improvement. Hang on a minute while I turn off the mung bean stew so I can go and meditate…..). Goal follow up: Proactive follow up is vital to maintain momentum and provide engagement and support. To properly get to grips with the art and science of prescribing self care it is vital to understand what is really going on in musculo-skeletal pain. The most accepted model of pain is the Biopsychosocial model – a bit of a mouthful hence commonly abbreviated to BPS. If you find the word makes you want to glaze over just substitute the concept of ‘holistic” as this pretty much means the same thing! Conversely, positive thoughts and beliefs or a supportive social context generally leads to the pain signals being “turned down” by the brain. For effective self care it is important to gain some idea of how each of these 3 areas is contributing to your client’s pain situation so that you can target your suggestions accordingly. The hands on portion of the treatment can address any “issues in the tissues” such as trigger points or fascial adhesions that may be contributing to the ongoing pain. However the psychological and social factors can only properly be addressed via self- management suggestions. Choosing the most appropriate self care suggestions for a particular client or condition can seem like a minefield so, as with most things, it is helpful to have a map to guide you through the process. Reflecting back to the client any social factors that may be perpetuating the pain condition. Common themes in this category include being unhappy in a job or relationship. It is not your job to “sort this out” but helping the client identify these factors as being relevant can be very powerful. Quite simply your self- care suggestions should draw on each of these categories for a full all round biopsychosocial approach to treatment. It is important not to overwhelm your client with too many suggestions at once – we usually recommend between 1-3 exercises a session depending on complexity. Self care suggestions should be reviewed at every treatment to see how successful the client has been at carrying them out and can be built on, week by week. For massage therapists to move forward in the 21st century it is important that we embrace all the aspects of our great profession. Long before the coining of the term “biopsychosocial”, complementary therapists had a core belief in holism – defined by the dictionary as “The treating of the whole person, taking into account mental and social factors, rather than just the physical symptoms of a disease”. In the holistic approach, clients are seen as active agents in their path towards healing with the practitioner role being that of a facilitator towards this aim; client and therapist work as an alliance towards mutual goals. Self care has always been an integral part of this approach. With our modern knowledge of how psychology can influence pain states, now is the time to reclaim self- care as a vital part of a successful treatment. Using the biopsychosocial model as a basis gives us a clear map to navigate different self care options to prescribe the most useful approaches for our clients. Remember that the MAPS (Movement, Advice, Psycho-social aspects and site specific interventions) process helps to ensure that your self care suggestions are addressing all aspects of your clients pain condition:. Ensure you set aside enough time in your hands on sessions to goal set and review successful outcomes with your clients. Motivate, inspire, encourage and watch your results increase! Our philosophy around self care is part of an overall approach to excellence in soft tissue therapy for chronic pain as pioneered through our book “Massage Fusion; the Jing method for the treatment of chronic pain”. For further reading on the subject hit chapter 11 of the book. Rachel Fairweather is author of the best selling book for passionate massage therapists – ‘Massage Fusion: The Jing Method for the treatment of chronic pain”. She is also the dynamic Co-founder and Director of Jing Advanced Massage Training (www.jingmassage.com), a company providing degree level, hands-on and online training for all who are passionate about massage. Beinart, N.A. et al., 2013. Individual and intervention-related factors associated with adherence to home exercise in chronic low back pain: a systematic review. The spine journal : official journal of the North American Spine Society, 13(12), pp.1940–50. Engers, A. et al., 2008. Individual patient education for low back pain. The Cochrane database of systematic reviews, (1), p.CD004057. Furlan, A.D. et al., 2002. Massage for low back pain. The Cochrane database of systematic reviews, (2), p.CD001929. Long, A.F., 2009. The potential of complementary and alternative medicine in promoting well-being and critical health literacy: a prospective, observational study of shiatsu. BMC complementary and alternative medicine, 9, p.19. Rotter, J. B. (1966). Generalized expectancies for internal versus external control of reinforcement: Psychological Monographs: General & Applied 80(1) 1966, 1-28.Nicholson, R.A. et al., 2007. Psychological risk factors in headache. Headache, 47(3), pp.413–26. Sengul, Y., Kara, B. & Arda, M.N., 2010. The relationship between health locus of control and quality of life in patients with chronic low back pain. Turkish neurosurgery, 20(2), pp.180–5. View Improve your results for clients with persistent pain article by pressing on the link! 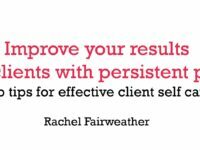 Download Improve your results for clients with persistent pain! (251 downloads) here!